These Onyx Sun Drop Earrings flow with rich autumn colors. 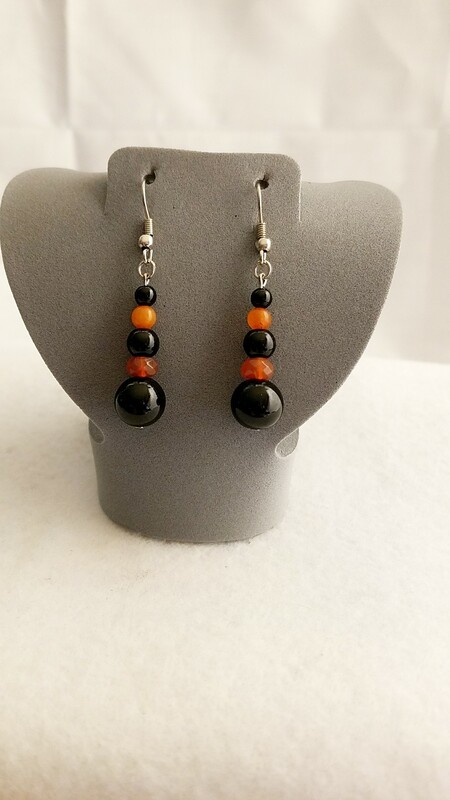 Our Black and Orange Drop Earrings are just what you need for a simple day at the office or just a day out with the girls. These Onyx Sun Drop Earrings have a beautiful flow of rich autumn colors. Made from Black Onyx, Black agate and a Red agate that I chose to make sure its color was perfectly orange, as it reminded me of an orange sun. 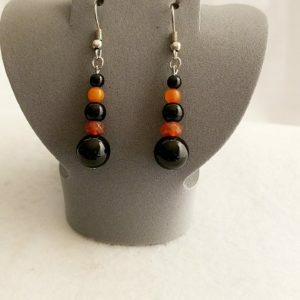 These Onyx Sun Drop Earrings will work perfectly for an October or all Fall outfit or wardrobe. Please Note: Crystal properties listed on this site are for information purposes. Always consult a physician for proper medical treatment. Earrings measures: 2" from ear wire to tip and beads by themselves are 1 1/2" alone. 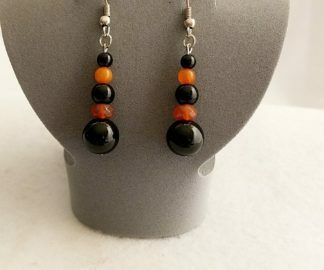 Therefore if you would like more information about the gemstones and items I use in making my handmade items like this, Onyx Sun Drop Earrings Materials Description Page. Let these Onyx Sun Drop Earrings work perfectly for your October or Fall outfit this year.